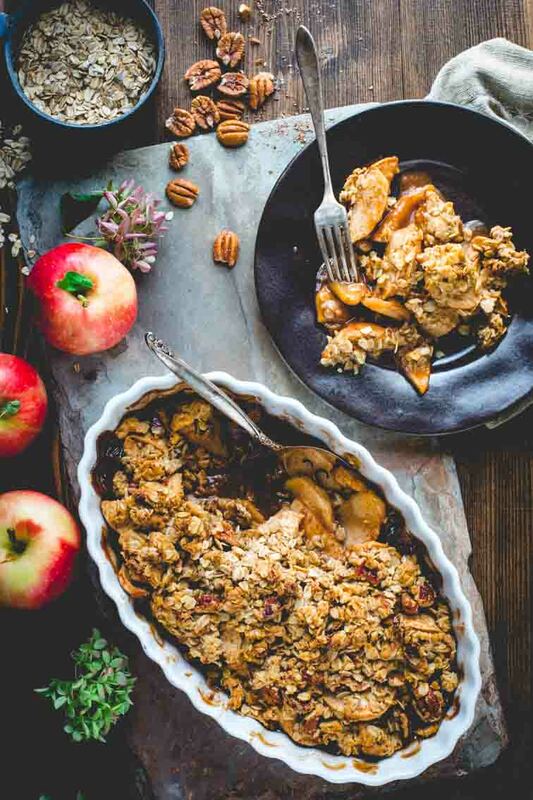 This Healthy Apple Crisp is the perfect dessert to bake this fall. It’s made with two varieties of apples to amp up the juicy flavor and then topped with pecans and rolled oats to really take it to the next level! It is sweetened naturally with maple syrup, which means it’s made without refined sugar. 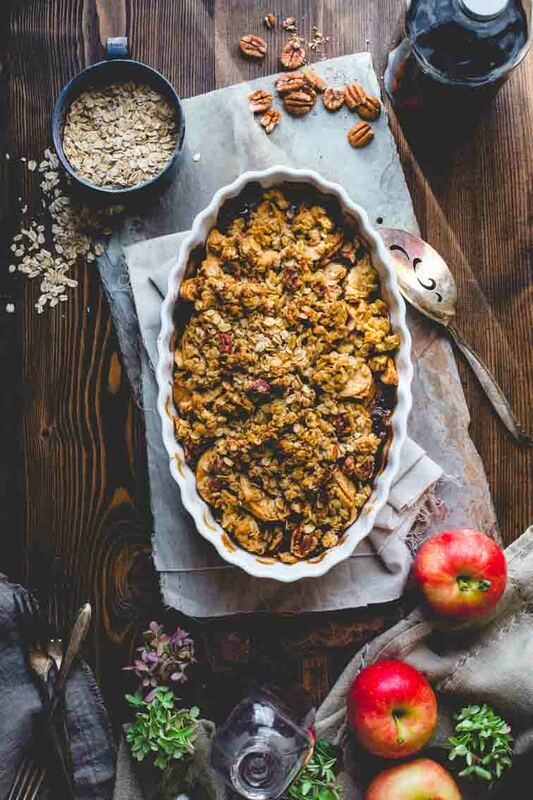 Before I share this maple sweetened healthy apple crisp recipe with you, I’m going to tell you something, and I am pretty sure you’re going to think I’m a big fat liar. But I’m going to tell you anyway. Here goes: There are 7,500 varieties of apples grown in the world. I know. Liar liar pants on fire, right? But I’m not making this up. University of Illinois says so. Crazy huh? Even crazier to think that in all that amazing diversity, there are only 100 varieties grown commercially in the US. 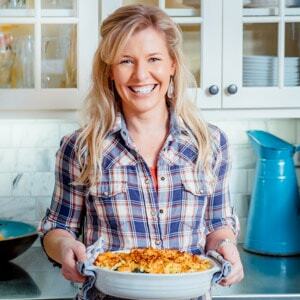 How about a list of 5 awesome tips for making perfect apple crisp? Lists are good for focusing. The reason you want to blend your apples is that some varieties break down and get saucy when they are cooked, most notably the McIntosh, and some hold their shape, like the Gala. When you use a blend of apples you’ll get filling that is juicy and chunky. You’ll also get a more interesting flavor profile when you blend varieties, because different varieties taste sweet, tart or even floral. I wrote a whole cookbook about maple, so obviously I am a huge fan of it. 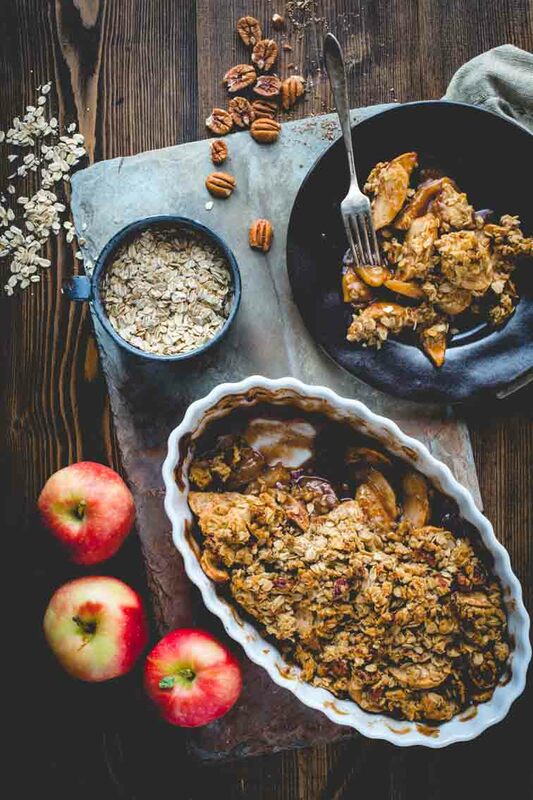 But among the many reasons it is a great choice in apple crisp is that it is a natural sweetener so it is healthier because it is unrefined. Meaning nothing is added to it, and the only thing that is taken away from it is water… it’s just reduced sap from a maple tree. So it still retains its trace minerals and nutrients. Plus it has anti-inflammatory properties, antioxidants and it is lower glycemic than other sweeteners. There are a bunch of reasons that have to do with the environment, but I am not going to get into that right this second. See? I’m trying to stay focused. I used a heavy hand with the spice today because I wanted to make sure my house smelled 100% like fall while this crisp was baking. And I wanted the crisp to be 100% delicious. I used a blend of cinnamon and nutmeg for a perfectly classic taste, but you can also experiment with a little bit of allspice, ground ginger or clove too. Start with ¼ teaspoon. Or you can get a little more experimental and try cardamom or orange zest. In my cookbook, I refer to maple’s BFFs. These are the ingredients that naturally make maple taste more mapley. Because maple is a natural ingredient, and it’s natural maple essence has limited flavoring potential, strong flavors can overwhelm it. And I have to say that the cinnamon and nutmeg do somewhat overwhelm the natural maple flavors here. So I used two of maples BFFs, butter and pecans, to bring the maple flavor back out. When they’re paired with maple, it taste more mapley. So you can have your cinnamon and taste your maple too. I used my favorite 2 ½ quart casserole dish to make this, and it was heaping when I put the apples and crisp topping into it. But then when the apples cooked down and get all bubbly and juicy, they fit perfectly. Okay, now we can go back to procrastinating and trying to name all of the apple varieties. Hmmm… Red Delicious, Golden Delicious, Braeburn, Paula Red…. What apple varieties do you love? 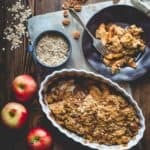 What are your tricks for the best apple crisp? Have you been apple picking this year? 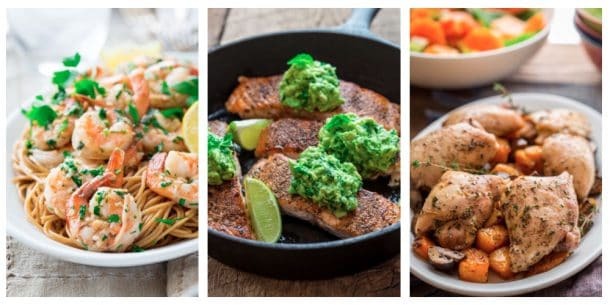 Are there any spice combinations that you’re going to try? 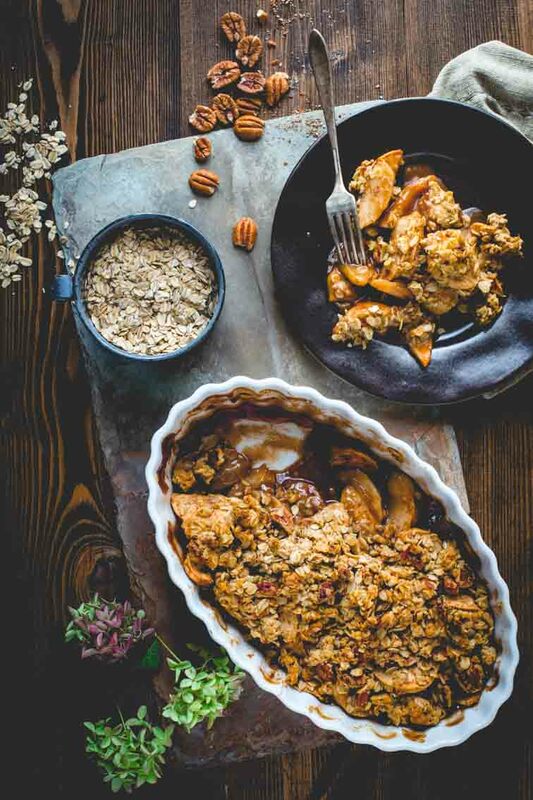 This Healthy Apple Crisp is the perfect dessert to bake this fall. It’s made with two varieties of apples and is sweetened naturally with maple syrup. Preheat oven to 350ºF. Coat a 2 ½ quart casserole dish with cooking spray. Toss apples, 3 tablespoons flour, maple syrup, cinnamon, nutmeg in a large bowl. Transfer to the prepared casserole dish. Mix the remaining 1/3 cup flour, butter and sugar together in a medium bowl with fingers until the butter is worked into the flour and the mixture becomes crumbly. Add nuts, oats and salt and work into the crumbs. Top the apple mixture with the crumb mixture. Transfer to the oven and bake 15 minutes. Without opening the oven, reduce oven temperature to 325ºF and continue baking until the apple mixture is bubbling along the edges and the topping is golden 60 to 65 minutes longer. I’m seriously in love with this! I’m obsessed with apples but have never included maple before. That has to change! This apple crisp looks amazing! I would love a bowl of that with a little ice cream on top! Now you’re talking Marye! That sounds too good! Granny Smiths would be good to blend in for their tartness, but try adding Macs too. I think you’ll really love the way they become saucy. Thank you for stopping by Heather! Mmmmm that looks delish! Can’t wait to try it! Please let me know if you do try it Zerrin! I love love love love apple crisp. The pictures look amazing, and I cannot wait to try! Thanks so much Matt. Me too, especially when it’s still warm. Please let me know if you try the recipe! Apple crisp is by far my favorite dessert, who knew 7,500 kinds of apples! 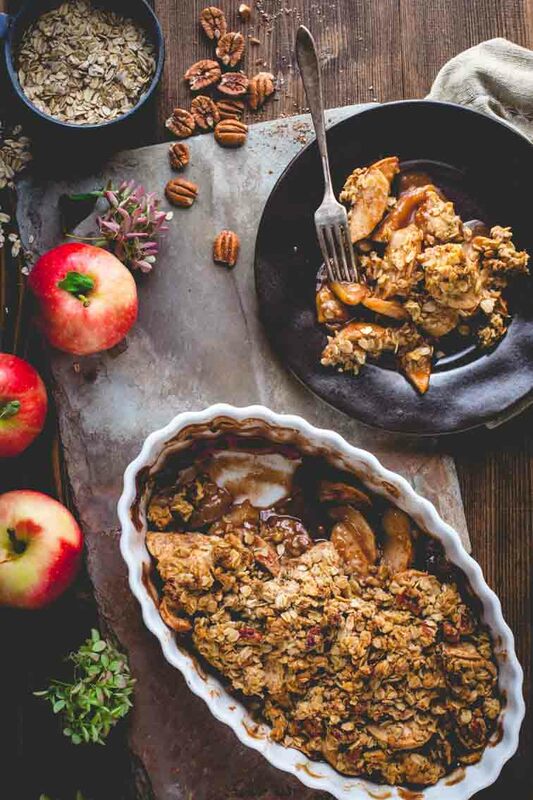 Apple Crisp season may just be the best time of the year. I love apple picking and choosing all different varieties to use together! Yum! This was a great Sunday dessert So the whole family could eat it, I used a soy butter substitute, as my son doesn’t eat lactose. The use of more than one type of apple and the thick crunchy topping make this superior to many crisps I have made. Thank you! I am thrilled to hear it Vivian. Thanks so much for letting us know how it went. This is the BEST apple crisp I’ve ever made ..thank you!! Diana, Thank you so much for coming back and letting me know you liked it! It is comments like these that really fill up my sails and keeps me going! Side note, I just made this past weekend too, and I’ve been treating myself to a bowl of it for breakfast. Happy Cooking! I’ve made this twice and both times for groups and got lots of great comments. I like using maple syrup inside of sugar. We do whipped cream for a topping. I’ll be making again this week while on vacation to share with friends at an afternoon tea. Wendy I am so glad you’ve discovered this recipes. It is one that I make over and over too. Everyone always loves this one. Glad you came back to review. I really appreciate it! Can this be made without nuts? Or does it effect the consistency too much? You can totally make it without nuts and it will still work just fine. If you want a similar texture you could sub in seeds of your choice such as pumpkin and sunflower. I’m loving all the apple desserts right now. This one is the prettiest for certain! That’s so nice of you Kristy! Thanks so much! Delicious! My husband will be forever grateful for this recipe! Oh My! This is just the perfect treat right now!